Last weekend, Ryan and I climbed groggily onto a bus at midnight and spent the next seven hours steadily making our way from Madrid to Barcelona. The scenery consisted of primarily industrial signs and random dots of white lights in the distance signaling yet another little village spotting the Spanish tundra. If there was more to see between midnight and seven am, I wouldn’t be the wiser considering the majority of our night was spent trying to figure out how Cirque du Soleil performers masterfully bend and manipulate their bodies in order to fit into small spaces such as a tight bus seat. Albeit a cheap and convenient ride, there is something to be said for spending a few extra bucks on an overnight train with a bed and a martini rather than a seven hour bus ride that feels like a sauna because the driver somehow forgot that we were in Spain and not Mongolia. Picking up our rental car, we made our way to Tarragona, located on the Mediterranean coast just south of Barcelona for the night, enjoying a fabulous dinner of Mexican food and Tequila. Although I could never imagine myself living in Tarragona due to both the size and the overall traffic nightmare, we did enjoy the old windy streets, a random Keith Haring like mural alongside a dilapidated brick building, the salty warm winds coming off the water as we walked barefoot across the sand, as well as the artsy jewelry and boutique stores lining the streets. In addition to all this, we also had the opportunity to take a tour of some incredibly well kept Roman ruins. However, being that we had a 10:30 appointment with Bodega Ficariavins the following morning; we ended our night early in order to drive approximately one hour inland the following day to a tiny little town situated on top of a hill called La Figuera in the region of Priorat. Surrounded by the Montsant mountain range rising up 1000 meters in the North reminiscent of the Great Wall of China, and the mountain ranges of Llebaria and Santa Marina to the South, the region is absolutely breathtaking. In addition to the looming mountain ranges, the landscape is spotted with budding olive trees, almond trees blossoming with pink or white flowers and rows upon rows of vines creeping up upon terraced lands. It was an incredible site to behold despite the forceful winds and the cloudy dark ominous sky. The scenery in combination with the old sparsely populated villages that hold an average of 400 or so habitants made this area feel more like a fairytale creation than an existing place. I can only imagine how awesome the sun’s influence would be against the brilliant red and yellow soil, the light pastel flowers, and the variant shades of green along the landscape. After winding our way through the valley, we finally made our way up the hill where La Figuera boldly sits looking out among the mountains. A little perplexed as to where exactly the Bodega was, we took out our cell phone and gave a ring to Jaume Roca and his wife, Montse, who owned Bodega FicariaVins. My guess is that this wasn’t the first time they have received a phone call with guests lost amongst the olive trees, because his sympathetic tone and “we’ll drive down and meet you shortly” hinted to past occurrences. Approximately ten minutes later, they pulled up behind us and got out of the car with open arms and warm smiles. Jaume, a solid built man with warm glowing eyes and a dry sense of humor inquired as to whether or not we would like to begin our day with a tour through the region or if we would prefer a tour of the Bodega followed by a regional tour later. Because the day was continuing to become more brisk with overcast skies, we opted to begin with a regional tour, hoping that once our bones had become frigid from the wind, we would be able to sit down to a warm lunch and good wine. Our morning drive through the Priorat region consisted of a lengthy description of how the political region of Priorat is broken down into two distinct wine regions, an explanation of the land, a tour of an old Monastery where the art of viniculture began in Priorat, a local wine store and occasional stops along the road to view some of the most breathtaking scenery we have seen in quite some time. As we winded our way through the curvy and bumpy mountain roads – off setting the equilibrium of my stomach and head for the next week, our guides gave us an incredibly thorough description of both the region and the land. To be honest, we expected our visit to be composed of a brief tour of their lands, a short tasting and a light lunch consisting of no more than a few hours; but in total, a few short hours enfolded to eight hours of their Saturday hosting and chauffeuring us throughout the region. By the end of the eight hours, not only were we dumbstruck with the amount of time and energy they so graciously spent on us, but also the dedication and passion they possessed in making their Bodega a rising star in the DO Montsant. The official Priorat territory was set up by the Divisió Territorial de Catalunya in 1936 (the administrative territorial division of Catalonia). After this, apart from the historical Priorat, the region included the old Cabacés Barony which in turn belonged to the Diocese of Tortosa, part of the Escornalbou Barony, property of the Archbishop from Tarragona, and finally the Cornudella and Ulldemolins Valleys together with the villages of MarçÃ and Falset which all belonged to the County of Prades. As a result, the following villages have constituted el Priorat since then: La Bisbal de Falset, Cabacés, Capçanes, Cornudella del Montsant, Falset, la Figuera, els Guiamets, el Lloar, MarçÃ , Margalef, el Masrroig. El Molar, Pradell de la Teixeta, la Torre de Fontaubella, Ulldemolins and la Vilella Baixa. Being that his Bodega is located directly on the border between both the DO Montsant and the DOC Priorat, imagine how confused we were as we toured the region. The typical joke from Juame was, “Now we are in DOC Priorat..wait, nope we just crossed the border into Montsant…wait..now, we are in DOC Priorat.” I imagine that we must have bounced back and forth into both regions a dozen or so times throughout the course of the day, making my regional notes more resemble hieroglyphics than actual facts and figures. As we continued to meander farther down the mountain into the valley, Jaume pulled over to the side of the road. As we stepped out of the car and inhaled the incredibly fresh clean air, Jaume picked up the grey rocky dirt, breaking down the soil type in the Priorat region. Historically, the mountains contained a prehistoric lake which evaporated over time, leaving a soft stony soil consisting of limestone and loam over slate and quartz, called llicorella. Depending on exactly where and high you are in the region, the color and density of llicorella can change dramatically from bright yellow to a deep glowing red to a mousy brown. Many claim that this stone is the reason that Priorato wines are not only so intense but is responsible for their telltale minerality. Jaume was also quick to point out that while Llicorella is the primary soil in the Priorat (actually the primary defining physical trait of it’s borders), it is not found in the DO Montsant. 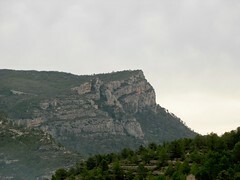 However, there are small outcroppings that can be found in DO Montsant that defy the authorities and give the wines here that same mineral composition that you find in Priorat wines. In general, the soil in Montsant is a clay like soil with calcium and schistous elements creating a hard and brittle soil. Although not Llicorella, vines still must struggle and force themselves to grow, whereby create more concentrating concentrated and bold wines. Additionally, because mechanization (using machines to harvest) is not only nearly impossible along the incredibly steep terraced lands, many Bodegas are forced to harvest manually which is not only expensive but time consuming. 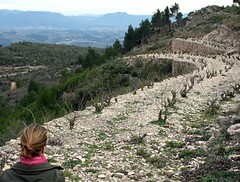 Therefore it is normal for a Bodega, such as FicariaVins, to own smaller plots of land dotted alongside several different slopes as compared to the monster vineyards we have seen in La Mancha; but if you consider the steep loose soil and the harsh conditions which force many Bodegas to pick by hand, five hectares is incredibly sizable. The task to harvest these lands can supposedly be so complex, expensive and time consuming that, over the years, it has forced many small family run vineyards to close shop in hopes of finding more stable work in big cities like Barcelona or Tarragona. Climbing back into the car, only to set my head and stomach on another rollercoaster of adventure, I thought to myself how incredible it must be to look out upon this land everyday in hopes of making an income. As mesmerizing and stunningly beautiful as this area was, I was clueless as to how I might go about producing wine if I owned the land. However, as explained by Jaume, the secret is in both the altitude and the orientation of land. Because his vineyards are located near the Ebro and Montsant Rivers, the summers are moderate during the day, while the cool and wet Mediterranean winds rush through mountains and into the valleys at night providing the grapes the opportunity to recover from the day’s heat. Interestingly, not only is the soil fabulous for grapes, but it is also ideal for olive trees as well. Looking out upon the valley, the land is covered with the gnarly thick trees that craft some of the most amazing olive oil we have ever tasted. Made from a small olive called Arbequina, its flavors are smooth, fragrant and overflowing with artichoke, herbs and sweet flowers, we were completely taken by surprise with the quality and texture of Ficariavin’s olive oil. Unfortunately, their olive oil – like their almond trees – are too labor intensive to produce on a large scale, leading me to suggest a visit to their winery if you ever would love to sip some of the most heavenly olive oil your lips will ever touch. Our next stop was a tour through Antigua Cartuja de Escaladei, the first Carthusian Monastery located in Priorato on the Iberian Peninsula. Built in 1194 by King Alfonso II of Aragon, it was later donated to the monks in recognition of both their piousness, as well as their ability to contribute economically to the region by introducing arts such as viticulture. This is an extremely important part of wine history because it was the monks who actually took over from where the Romans left off in art of wine production. If it wasn’t for our virtuous little friends, we might not be enjoying deep inky grenacha, and rich intense syrahs that we’ve come to love from this region. The monastery itself was named after a boy who (depending on the version you choose to believe) saw, dreamt or hallucinated about angels descending a celestial ladder from heaven. This caused the Shepard to hightail it to his local priest and share his vision. Consequently, the Priorato de Scala Dei, the Priory of the Stairway of God, was founded in 1163. According to Montse, throughout her childhood, she and her family would come here every year and celebrate festivals, while still able to see the old Fresco paintings. 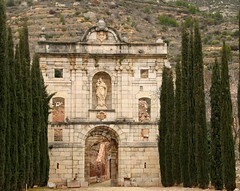 Sadly, in the past thirty or so years, through both weather erosion and theft, the Monastery has been destroyed. Although a restoration has been planned, it still both frustrates and saddens me to think how many people have taken off with a bit of history for no other reason than selfishness. However, it is an amazing site to behold and part of the tour provided by Ficariavins. For 8 Euros, you can receive a tour of their stylish little Bodega with an amazing view, their vineyards containing vines well over a hundred years old, and a complete tasting sample of their wines. Their second package for 45 Euros, consists of everything provided by the first package, in addition to a full breakfast and lunch along with the opportunity to participate in an activity such as: pruning or planting vines. If you are anything like me and enjoy getting your hands dirty while understanding a process from a physical and earthy standpoint, this package is incredibly enticing. 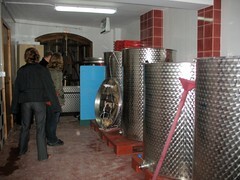 It allows you to get a taste as to how labor intensive and intricate wine making can be. From helping to green prune under-ripe bunches of grapes to learning to graft a new vine, you have the chance to see the wine world from a winemakers perspective. For me this is a great way to understand how to take and get wine from a vineyard full of gnarled vines. The land itself has been in his family for generations, although the grapes were sold off to cooperatives which had dominated the land for decades; the Grenacha Black, Cabernet Sauvignon and Syrah grapes are now being used to produce some fantastic wine. Hopefully, Fincaria can accumulate a few more Hectares of dilapidated vineyards left behind by other families who couldn’t support both themselves and the land, to reach the production level that they have established as their goal. To see Jaume bent amongst his vines as he passionately explains his hopes and dreams with the land and their wines, you are swept up by his determination. Each grape is picked by hand, carefully chosen for its quality and character; hence, it is of no surprise that their wines are both bold and delicious. The name of this particular bottle was derived from Juame’s father who has clearly shown incredible dedication and passion for the vines. His devotion to the vines, which have been in their family for generations, is so powerful that he has been managing their growth and development while Juame supplements the bodega’s income with their family run accounting business. It is a pleasant reminder of how much patience and diligence one must have to create a business from the ground up. Pater is made from one hundred percent Garnacha Black, it has been half fermented in French oak barrels and half in stainless steel tanks and aged for 12 months in oak barrels. Personally, I found this wine to incredibly bright and spicy. The color was rich inky purple black with a slight circle of brown along the rim. On the nose, I was immediately hit with an incredible spice and pepper aroma, followed by hints of charcoal and cranberry. Whereas the palate showed a lot of clove and cinnamon with strong secondary flavors of pepper, wild berries and burned wood. Overall, a nice wine with medium body and light acidity. I love the story of how this bottle was named. Juame and Carme have four children, but one of their daughters has become a little Oenophile at a very young age. Can you guess what her name is? Evidently, Elia is a hound for grapes and loves to follow her Dad not only to the vineyard, but also to the Bodega where she can watch and participate in the production of yet another great wine. 80% Garnacha Black, 15% Carbernet Saugvignom and 5% Syrah, this blend is a dynamo. Each grape has been fermented separately in stainless steel tanks and then aged in French oak barrels for 6 months. The color appeared to be a slightly more intense and rich purple, while cranberry, schist and pepper jumped out on the nose. On the palate, licorice and plum overlaid flavors of pepper and charcoal. Generally a very nice well balanced wine and something I would be prone to seek out again. In the end, I would describe Ficariavins as having a a wonderful thing going for itself. The wines are fabulous, they have a very informative and well laid out website and are incredibly forward thinking in their desire to promote the region’s wines as a whole through their tourism packages. Additionally, both Juame and Carme are extremely open and receptive to anyone like me who are still new to the area of wine but who have a passion to learn, making the entire process more like a story than a sterile agricultural method. Additionally, the time we spent with Jaume and Carme was unforgettable, not only for their graciousness, but also for their passion. Like Ryan and I who finally bought a ticket to Spain without a dime in our pockets, a job or the ability to speak the language, Jaume and Montse took a risk and re-appropriated their vineyards after years of selling off their grapes to Cooperatives. Using their bookkeeping business for neighboring Bodegas as a model for what not to do in running a business, they turned to one another and forged an agreement between themselves: their Bodega would function and work with a little time, patience and perseverance. I believe we all can attest to having dreams, but very few of us have the courage and wherewithal to actually pull it off. So today, Ryan and I take our hats off to FicariaVins in hopes of a profitable future and continual support from little people like ourselves who can empathize with the struggles and joys of pursuing a dream. Tourism Tip: When in Montsant we stayed at a Casa Rural, basically a country house, that we would like to recommend. We are not being paid to, but we had such a great time and the owner was such a joy to talk to that we couldn’t help but mention it. In the Town of El Molar, Prexe is a great place with a per person charge that can include a full breakfast or dinner. Our room overlooked the distant mountains and our breakfast gave us a chance to try a variety of local meats and cheeses. Do check them out if you decide to make the trek to this neck of the woods.